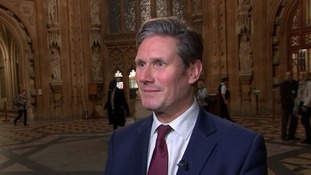 Sir Keir Starmer said Labour will use a Commons amendment to require the prime minister to hold another "meaningful vote" by February 26. Sir Keir said a second referendum "must be on the table" days after the Labour leadership said it was "not the default option". Shadow Brexit Secretary Keir Starmer has told ITV News that he would vote Remain if there was a second referendum. The shadow Brexit secretary said all options must be on the table – including a second referendum. Labour looks set to back the option of a fresh referendum on EU membership, when the motion is put to a vote at the party's conference. 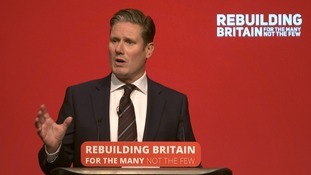 Sir Keir Starmer said he would vote to remain in the European Union if there was another referendum. Jeremy Corbyn’s party set out its plan for a ‘new single market’ deal, but some pro-EU Labour backbenchers say it does not go far enough. Keir Starmer says Labour will try to rewrite Brexit legislation, if it is rejected in Parliament, to avoid leaving the EU without a deal. It is "clear" ministers cannot proceed with the current Bill, Sir Keir said, threatening to "work with all sides" to ensure revisions. Labour has committed itself to continued membership of the EU single market and customs union during a transition period following Brexit.